Physics Professor Themis Mastoridis has made a career out of causing collisions — on a very small scale. 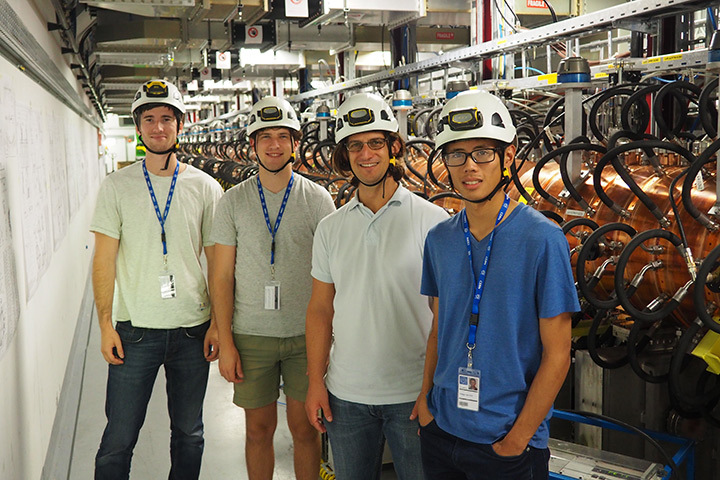 With a $750,000 Early Career Research Program grant from the Department of Energy, he and his student research team will play a key role in the coming upgrade of the world’s largest particle collider, the Large Hadron Collider (LHC). Located at the European Organization for Nuclear Research, or CERN, in Geneva, Switzerland, the LHC speeds up particles until they are traveling almost at the speed of light and then crash the particles into each other. These collisions can generate previously unknown particles that provide insights into the fundamental workings of the universe. The discovery of the Higgs boson, for example, resulted from data collected from the LHC. Using computer models, Mastoridis and his research team investigate possible changes to the accelerating systems, which are the engine of the LHC. These systems provide the energy needed to accelerate the particles close to the speed of light. The students who Mastoridis mentors experience the thrill of traveling to Geneva to work with an international team of scientists and see the results of their hard work firsthand. Physics major Ben Miller spent a week at CERN observing testing on the system he’d previously known only through his computer models. With the new grant, Mastoridis will also bring his expertise to bear nationally. He will contribute to a new electron ion collider being built in the eastern U.S. and will help design a new light source for the SLAC National Accelerator Laboratory operated by Stanford University in Menlo Park, Calif.